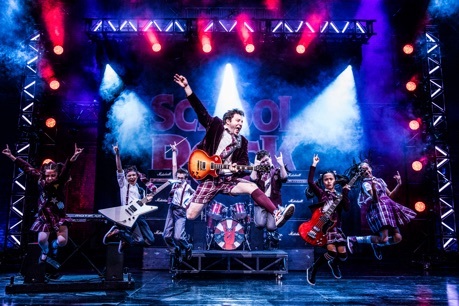 After a string of flops Andrew Lloyd Webber’s School of Rock from 2015 marks his first successful musical since Sunset Boulevard of 1993. The new musical signals a turning back to the rock ’n’ roll style of Jesus Christ Superstar (1971) and Joseph and the Amazing Technicolor Dreamcoat (1974) before he turned to quasi-operatic style of Evita (1976) and The Phantom of the Opera (1986). 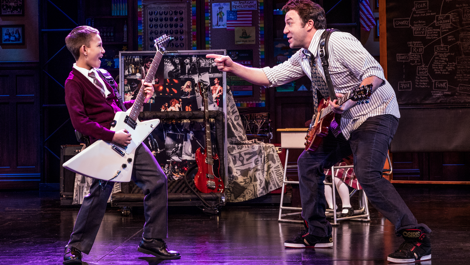 Nevertheless, School of Rock hardly matches any of those musicals in freshness or quality of story and song. The one aspect that audiences will love most about the show is that it features 12 amazingly talented children aged 9 through 15, four of whom play their own instruments. The one aspect that audiences will like less, besides a plot built of a series of improbabilities, is that the show hinges too much on the performance of the adult male lead. The story for School of Rock is based on the 2003 movie of the same name starring Jack Black. As in the movie the musical starts with guitarist Dewey Finn (Merritt David Janes) being kicked out of the band No Vacancy for constantly upstaging the lead singer. Dewey is especially downcast since he had been looking forward to No Vacancy’s appearance in the upcoming Battle of the Bands contest. Dewey has been living with his best friend Ned Schneebly (Layne Roate), a school teacher, and Ned’s girlfriend Patty (Madison Micucci), who is tired of Dewey’s mooching and wants him to pay the rent or get out. When the principal for the prestigious prep school Horace Green phones the Scheebly residence asking if Ned is free to be an emergency substitute teacher, Dewey attracted by the large salary offered claims to be Ned and accepts the job. Much of the humour comes from the predictable fish-out-of water situation since Dewey knows nothing about teaching nor about any useful subjects except for rock ’n’ roll. When Dewey hears his students playing Mozart in their music class led by the principal, Mrs. Mullins (Lexie Dorsett Sharp), he gets the idea of turning his class into a rock band. Initially, the students are sceptical. Their parents are paying big money at Horace Green to help get them into Ivy League universities. But, as it inevitably turns out, playing rock music helps the kids get rid of their frustrations with their parents and gives them a greater sense of self-worth than they had had before. It is already unbelievable that Dewey is able to keep up his charade for so long and is never made to conform to a dress code for teachers. Why someone complains about loud music coming from Dewey’s classroom only just before the kids’ big performance is far-fetched when amplified sounds have been emanating from there for weeks. But where you know the show, like the movie, has headed into Fantasyland is when Dewey enters his class of fifth-graders into the Battle of the Bands against adult competitors. From here until the end all the emergencies and their resolutions are foreseeable from countless other underdog competition movies. As a musical School of Rock comes off as a mashup of The Music Man (1957) with its charlatan whose teaching music gives children self-confidence and Matilda the Musical (2010) with its class of intelligent children in an authoritarian school. Yet, School of Rock is not as good as either because it doesn’t explore the implications of its situation in as great a depth, if at all. Its most disappointing aspect, a holdover from the movie, is that Dewey insists on being the lead singer of a group of school kids despite having found his lead singer, Tomika (Grier Burke), among them. She gets one line to sing in the band’s big performance. Yet, if this is really about Dewey changing a group of proper prep schoolers into a rock band, why should he, an adult, be in it at all? Why not have their group called School of Rock be completely the kids’ thing? He can still take credit for having trained them. The book writer is Julian Fellowes, best-known for creating and writing the television series Downton Abbey, but you would hardly know it. Here Fellowes has a adopted the style of a middling sitcom that suffers from a serious deficiency of wit. The show’s most memorable song, given two reprises, is “Stick It to the Man”, derived from a phrase in the movie. Here, given that it is sung by a group of privileged prep schoolers in a musical with music and a book written by multi-millionaires, this ode to rebellion against the establishment is painfully ironic on many levels. Just think of the line, “Sick of corporate culture?! Stick it to the man”. Does this mean the musical’s producers the Warner Music Group and Access Industries which is trying to turn Warner Brothers movie titles into musicals? If he were not listed as the composer, you would hardly know that Andrew Lloyd Webber was the show’s composer since, except for a few favourite chord changes, the musical is so unlike his best-known work. His song for No Vacancy “I'm Too Hot for You” (based on a tune he wrote in 1981), is amusing as a typically bombastic rock song. His school song “Horace Green Alma Mater” and the “Faculty Quadrille” show off his ability to parody classical music. Only his song for the children lamenting how their parents ignore them, “If Only You Would Listen”, has any emotional weight comparable to the best songs from his earlier musicals. Although Lloyd Webber is capable of imitating almost any musical style, he follows the movie in its exceedingly narrow definition of what rock music is. All the bands Dewey names as examples to the students, except for The Rolling Stones, and Jimi Hendrix, are heavy metal or glam-rock which died out or mutated into other forms by 1990. There’s no punk, no grunge, no new wave, no rap, no hip hop and definitely no emo or trance. Thus, in the musical Dewey is teaching his pupils to “rock” in a manner that is antiquated by at least 25 years. As it is written, far too much of the musical depends on whether we like or do not like its main character Dewey. In the best light he is a wacky, charmingly irresponsible guy who gradually becomes authentically interested in helping children. In the worst light he’s an adult who is still mentally and emotionally an adolescent who uses people, including the children, to further his own desires for rock stardom. Merritt David Janes’s performance captures both sides of the character with a bit more emphasis on his vices so that it is very difficult to like him, let alone care whether he succeeds in his fraudulent and frankly narrow-minded enterprise or not. Janes has a characteristic, shared by most of the adult cast, of lack of clarity in diction when singing so that only about 50% or less of what he sings can be understood. The louder he shouts/sings, the less we catch his words. In contrast, Lexie Dorsett Sharp’s diction is crystal clear both when speaking and singing as Principal Rosalie Mullins. 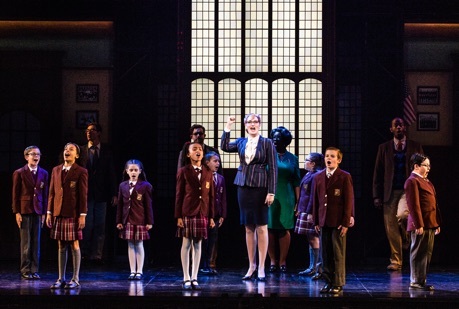 Sharp’s principal is no maniacal ogre like Miss Trunchbull in Matilda the Musical, but rather a stern enforcer of the school’s strict rules who represents order and counters the chaos of Dewey Finn. The role requires Sharp to sing in both an operatic style and in a pop rock style. She does both although she drops out the high Fs in the Queen of the Night aria “Der Hölle Rache” from Mozart’s The Magic Flute. Although it’s not believable that she would agree to go on a date with Dewey (there’s no such scene in the movie), Sharp does make it plausible that lurking beneath Mullins’s imperturbable exterior was once a free spirit. The rest of the adult roles are caricatures. Layne Roate is a typical milquetoast and hen-pecked boyfriend. Madison Micucci is a typical shrew and nag. Its nice that Fellowes has changed Tamiko’s hetero parents into two dads, but this is 2018 and there is no reason Matt Caplan and Liam Fennecken literally have to prance about the stage to let us know they’re gay. In interest the children far outshine the adults and we would much rather know more about them than about Dewey or Miss Mullins. We are told before the show starts and during the curtain call that the kids who play instruments are really playing those instruments. We have to be told since there is also an orchestra in the pit and since the whole show is amplified there is no way to know for sure whether an instrument played on stage is really the source of the sound we hear. Nevertheless, Theo Mitchell-Penner as Lawrence, the the uncool kid who learns to be cool playing keyboards; Mystic Inscho, a wizard on electric guitar; Leanne Parks, an unassuming girl who lets it all out on bass; and Cameron Trueblood, a seemingly straight-laced boy who goes wild on drums are fantastic to watch and will likely inspire kids in the audience to stick to their music lessons. As Tomika, Grier Burke has a great scene singing “Amazing Grace” unaccompanied, but it’s a shame she doesn’t actually become the group’s lead singer as we were expecting. In what is primarily a speaking role Sami Bray is very funny as the Hermione Granger of the class who is as much a stickler for class protocol as is Miss Mullins. Watching School of Rock one generally feels that Fellowes did not go far enough in adapting the screenplay to the stage. A showcase for a known comic in a film will not necessarily succeed as a showcase for an unknown actor on stage especially if he surrounded with super-talented children. On stage our interest will naturally be drawn to them, not him. Given that the character is not especially endearing or funny and that Merritt David Janes does nothing to make him so, time spent away from the kids feels like time wasted. Yet, the kids are there and although they don’t control the show as they do in Matilda, it is heartening to see how much talent they have and to leave with the feeling that the duty of adults is to encourage their children’s abilities whatever they may be. Photos: (from top) Mystic Inscho as Zack and Merritt David Janes as Dewey: Lexie Dorsett Sharp as Principal Mullins and the ensemble; Merritt David Janes as Dewey fronting the School of Rock band. ©2018 Evan Zimmerman-MurphyMade.